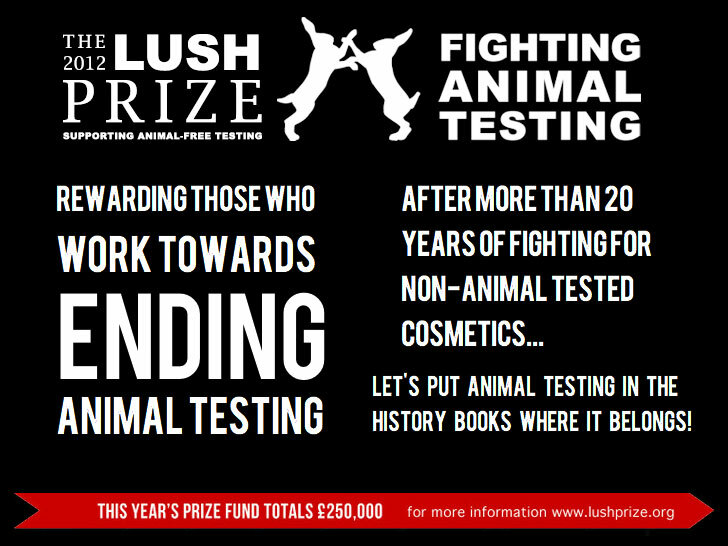 LUSH Cosmetics is serious about stamping out animal testing. So serious, in fact, that the natural-beauty firm will offer £250,000 ($389,675) every year until the practice is banned worldwide. The inaugural LUSH Prize, which debuted Tuesday, will be awarded to groups or individuals around the world in the fields of cruelty-free scientific research, awareness-raising, and lobbying. The £250,000 will either be doled in one lump sum for a major breakthrough, or distributed across five minor categories. The prize will either be doled in one lump sum for a game-changing breakthrough (namely a proof-of-concept toxicity pathway study), or distributed across five minor categories (science, training, lobbying, public awareness, and young researcher). LUSH Cosmetics is serious about stamping out animal testing. So serious, in fact, that the natural-beauty firm will offer �250,000 ($389,675) every year until the practice is banned worldwide. The inaugural LUSH Prize, which debuted Tuesday, will be awarded to groups or individuals around the world in the fields of cruelty-free scientific research, awareness-raising, and lobbying.